With over 50 years of hard-won experience in the business of packing and wooden case-making, we like to think we know a thing or two about the craft. So, what better way to celebrate the launch of our brand new blog, ‘Making a Case’ (in which we plan to add regular features of interest about our industry) – than by sharing with you an in-depth look at the process of making the perfect packing case. There is a great satisfaction to be had in watching a true craftsman busy at work in their chosen field, and with over thirty years of box-building experience in the bag, our in-house casemaker Nick Oakley is one of the best in the business. He kindly allowed us to follow and document his progress as he set to work on creating a bespoke packing case for one of our clients, the specialist instrument maker, The Horiba Group. 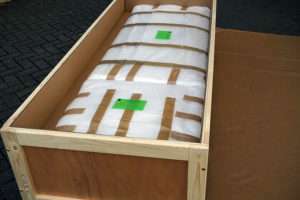 The client approached us with a request for custom-built wooden packing crates suitable for the worldwide transportation of a series of unassembled cabinets. So far, so straightforward, but the request came with the added specification that the client wanted to pack the consignment at their own premises. 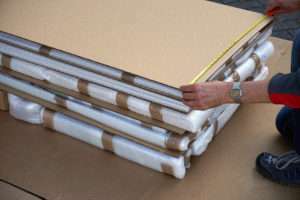 We therefore had the extra task of designing a set of pre-cut packaging materials that the client could easily use to safeguard their consignment, but without compromising its safety or protection. All in a day’s work for our expert team! One of the team soft-wrapping a delicate component with wallpaper…sorry, bubble wrap! By referencing dimensions supplied by the client, we methodically set about using wood and bubble to manufacture a series of pre-figured packing ‘templates’, each layer interleaved with heavy-duty cardboard for added support and protection. These template frames were constructed using 9mm plywood for rigidity and strength. At each stage of the process, we measured the frames to ensure we were working to the rigorous tolerances necessary in achieving a perfect fit. The inner packaging frames. We use 9mm ply and bubble wrap for the robust all-round protection. Measuring up: precise measurements are required in order to work out the dimensions for the final packing case. With the frames made and measured, it was time for Nick bring his considerable experience to bear on the building of the main case. As with most of our wooden cases, Nick used 75mm x 25mm PAR wood (PAR stands for “planed all-round”) for the baton edges. 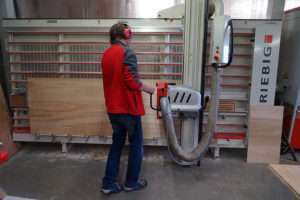 Nick using the vertical panel to cut plywood sides to size. 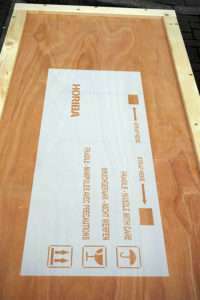 Plywood sides machined to the correct dimensions, Nick can get to work on the physical construction of the packing case, working with plywood and baton edges to build the strongest, most reliable packing cases in the business. Over the years, we’ve worked on some fantastic projects, which include making wooden cases for McLaren to transport their racing cars, and bespoke wooden crates for Pete Waterman’s model train collection. Nick uses an electric screwdriver to ensure all fastenings are secure. All of our cases are built so that at least two sides and the lid can be easily removed. Bottoms up. Nick screws the base to the sides, ensuring maximum strength and robustness. The project specification required that the client wanted to pack the consignment at their own premises. To this end, packaging inserts were carefully cut out and marked with clear directions to indicate their stacking order within the crate. Nick packs the crate according to the designated layout. 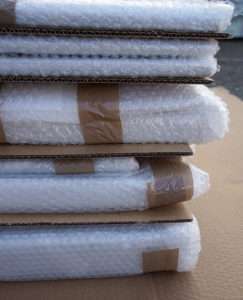 Once all the items are carefully packed in their designated positions within the packing crate, Nick can apply stencils to the consignment. We can stencil any shipment using a font of the client’s choice, style and size. 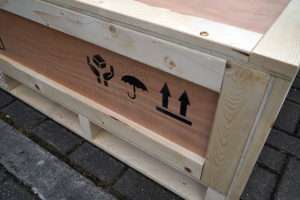 Every one of our crate is marked ISPM 15, which stands for ‘International Standards For Phytosanitary Measures No. 15.’ You can read more about packaging requirements here and on the website of the United Kingdom government. . The stencil is positioned on the case. 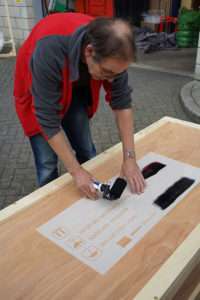 Paint is applied to the stencil. Detail showing some of the stencil as applied to the side of the crate. Every crate we make is marked IPSM 15 for compliance with global shipping custom regulations. Stencils in place, the finished cases are ready now to be forklifted on board one of our fleet of delivery vehicles, and for transportation to their next destination – in this case, a happy client! Some of our cases travel all the way around the globe, sometimes they make that journey more than once. Regardless of the distances involved, our clients can relax about the security of their shipment, confident in the knowledge that the shipping crate protecting their valuable cargo has been built by one of the most experienced case-makers in the business. 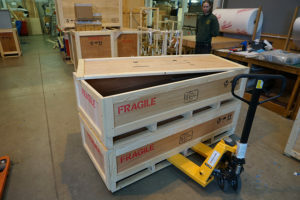 The two finished shipping crates ready to be loaded onto a vehicle for delivery to the customer.